On this page you can download the sample files that support your paper or e-book. If you have any difficulties consult the FAQ section at the bottom of this page. Locate the correct carousel. The Smart Method produce books for both the Windows and Apple Mac version of Excel. There are two carousels below, one for Windows books and one for Apple Mac books. Use the slider arrows on each side of the carousel to locate your title. There are blue arrows on each side of the displayed books. Use them to navigate to the title that matches your book. Double-check you have the right title using the ISBN number. When you’ve found your book hover your mouse over the book cover graphic – you’ll see an ISBN number. Check that the ISBN matches the number shown on the back cover of your book (just above the barcode) and on the copyright page at the beginning of the book. Click on the book title to download the sample files. Be sure to check out the links on the top menu bar for your title. The book’s product page often have useful additional material. Click the blue arrows on each side of the book titles to scroll through all books. Click on the book cover to download the sample files. You appear to be using a Pad device! (This may not be true if you simply have a very small screen or browser window). If you are using an Android or iPad pad device it is not usually useful (and in some cases not even possible) for your pad device to download files. If you really want to download sample files (and understand the technical limitations of your device) you can attempt a download by double-tapping a book cover below. You appear to be using a mobile phone! (This may not be true if you simply have a very small screen or browser window). If you are using an Android or iPad mobile phone it is not usually useful (and in some cases not even possible) for your mobile phone to download files. If you really want to download sample files (and understand the technical limitations of your device) you can attempt a download by double-tapping a book cover below. ISBN - This book does not have an ISBN. 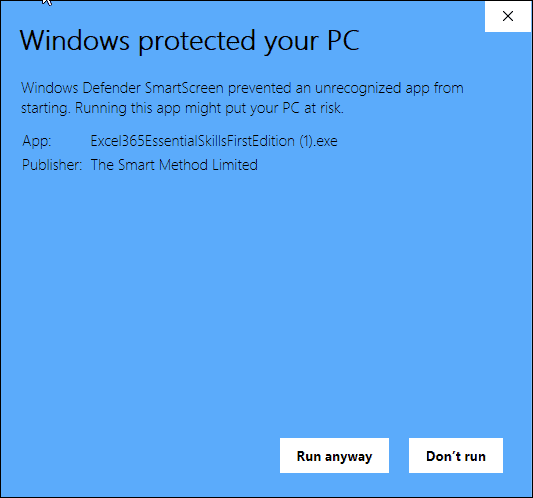 I am seeing a Windows Defender SmartScreen warning when I try to install the sample files. This file identifies the creator of the file as The Smart Method Limited (ourselves). It is safe to click the Run anyway button at this stage as the file is protected with a digital certificate (Microsoft obtain the publisher name from this certificate). We also publish the same set of files a zip file that you can download here. 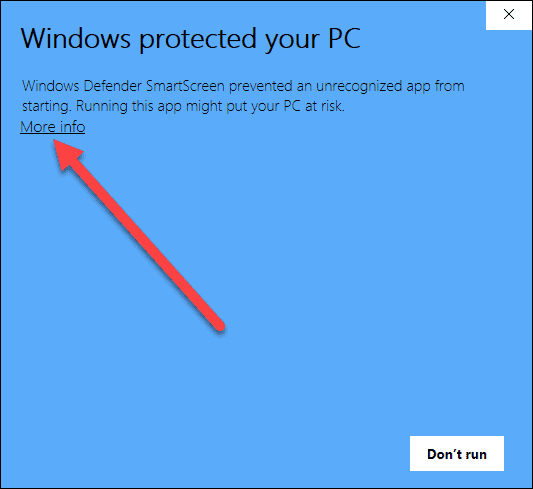 Zip files are not as convenient as .EXE files but do not prompt any SmartScreen warnings. I cannot download an executable (.EXE) file. What can I do? When I click onto the book cover graphic nothing seems to happen. All browsers download files in different ways. Perhaps you’ve never downloaded a file before so do not understand how downloads work in your browser? In the Chrome browser you’ll see a gray icon at the bottom left of the browser window. You need to click on the icon and then select Open from the pop-up menu. You then need to click Unzip in the next dialog. In the Edge browser you’ll see a gray window at the bottom center of the browser window. You need to click on the Run button in this dialog. You then need to click Unzip in the next dialog. I've unzipped the files but when I click on one nothing happens. This happens when the file associations on your computer have become corrupted. You can fix this but it is easier to simply open the file from inside Excel rather than by double-clicking it. I've unzipped the files but I can't find them on my computer. Files are extracted to the c:/practice folder unless you changed this default location when you extracted them. I can't run the executable file on my Mac. You’ve downloaded the wrong files. Select your mac book from the Apple Mac Titles images above. I can only see 2016 titles in the list but I have an earlier book. Notice the blue arrows on either side of the images. Click on either arrow to scroll through all book titles. I'm trying to load the files onto my iPad without success. The iPad cannot run the full version of Excel – though it can run a cut-down app version. You won’t be able to learn all of Excel’s features using the cut-down online or app versions. The iPad also does not support the concept of on-device files. The iPad needs you to install files upon a cloud drive to access them via the Internet. If you want to learn the full version of Excel you’ll need to learn it on a Windows or Mac personal computer. I have a book title that is not listed above. You can find every other book we have ever published in the image carousels above. I can’t seem to find the wealth of nations file. The Wealth of Nations.xlsx file is in the Essential Skills sample file set in the Session 1 folder. After downloading and extracting the sample files you will find them in the C:\Practice folder (or in whichever folder you chose if you chose to place them somewhere else). I have gone to step 2(4) on page 32 of the “Essential” Book, but I can’t open Session 1 Folder when I click OK as instructed. What is to be done? If you download the sample files and install them to the default location you will find them in the C:\Practice folder. You said you can’t open the Session 1 folder, but I am not sure what you mean by this – does something happen when you try to open the folder? If you’re having trouble following the lesson you might find the free video walkthroughs useful. If you’re still having trouble opening the sample files, please let us know exactly what is happening when you try to open them and we’ll try to offer further assistance. Thank you for your kind explanation. I am not very good with Window and tried to open Session 1 at the Unzip window. Now I can find the three files within Session 1. Thanks again. You will need a copy of Excel installed on your computer in order to use the sample files. In addition, please make sure that you have downloaded the files for your version of Excel – if you are using a Mac version of Excel make sure to download the Mac sample files. You can also download the sample files in the alternative ZIP format on this page. I have downloaded the sample files but cannot open them. I don’t recognise the type of file downloaded it is not an Excel document. The Windows sample files are provided in a Windows executable file that automatically extracts the sample files into your C:\Practice folder when it is opened. If you are not using a Windows computer you will not be able to open this file. If you are using a Mac, please download the sample files for the Mac courses. Otherwise, you can download ZIP versions of the sample files on this page. I have finished the Wealth of nations but can’t find first quarter Sales and Profit. I have downloaded all the files 3 x now. All I see is the Wealth of nations. Very frustrated. Its been about a month since I’ve started this and thought all the files downloaded at the same time! The Wealth of Nations is in Session 1, so it is in the Session 1 folder in your sample files folder. First Quarter Sales and Profit is in Session 2, so you will find it in the Session 2 folder, along with all of the other sample files for session 2. There are also folders for all of the other sessions in the course. It sounds like you have downloaded the correct files, all you should need to do is examine the folder they are in and you should see all of the sessions. If you are still having trouble finding the files just reply and I’ll try to provide more guidance. Mr. Smart, I am making my own checkbook register in excel, but would like to make it better. Is there a program you may have that can teach how to do it professionally? If you’re new to Excel you might want to start with our Essential Skills course, which will teach you many useful skills, including formatting and charts. If you’re already familiar with Excel, our Expert Skills course will teach you some advanced skills that could be of use to you, including tables and pivot tables. The Tables feature can improve almost any workbook by allowing tables of data to be automatically formatted and allowing formulas to automatically include new data when it is added. You can learn all about tables in Session 1 of our Expert Skills course. Pivot tables are very useful for creating summaries of data. These are covered in depth in Session 8 of Expert Skills. I have recently purchased your book from amazon ( Excel 2016 expert skills). i have downloaded the file but i am unable to locate inventory-1 file from the sample files. Any idea where it would be please? If the sample files have been extracted to the default location you will find Inventory-1 in the C:\Practice\Excel 2016 Expert Skills\Session 1 folder. If you can’t find it, it’s likely that the sample files haven’t been extracted or have been extracted somewhere else. You can always download a fresh copy of the sample files to make sure that you have the correct fileset. All the files downloaded without a hitch. Following your instructions, I was able to locate the downloaded files and successfully open them. It’s pretty simple folks, follow the directions in the book step by step with each lesson. I have purchased the book 2016 Expert Skills and have successfully downloaded the sample files. Suddenly I see that there is now a version Excel 2019 Expert Skills. Is there a large difference between the 2016 and 2019 versions? Actually I have MS 365 Home loaded on my computer, meaning I probably have the latest version of Excel. So I am debating whether to toss the 2016 book and start over from scratch. This whole mess is entirely my fault, because I was not attentive enough to notice that 2016 is now outdated. Microsoft release updated versions of Office 365 every month for home users and every 6 months for business users. Users of the ‘pay once’ version of Excel 2019 won’t receive these updates, meaning that your ‘Excel 365’ is no longer the same as ‘Excel 2019’. To address this, we now produce a dedicated Excel 365 course which we update every 6 months to make sure that it is always up to date for business users. Having said all of that, it’s still the case that most of the skills taught in Expert Skills will work as shown in the course. Most of the changes in the more recent books are new lessons added to cover new features. You might want to try the beginning of the book to see if you’re able to work around the differences, but if you do replace your book with a more recent version I would suggest getting the Excel 365 version rather than the Excel 2019 version.